The Creamy Eye Treatment with Avocado has a rich and creamy non-migrating formula that delivers moisture to the delicate under-eye area. A unique, concentrated texture that does not migrate into eyes, the treatment gently protects against external aggressors. Key ingredients include avocado oil to help restore the natural moisture of the skin, beta-carotene for antioxidant benefits and shea butter to protect skin from dehydration and restore skin's suppleness while improving the appearance of dry skin. Creamy Eye Treatment with Avocado is ophthalmologist- and dermatologist-tested and is not tested on animals. Apply gently with fingertips to the orbital bone without pulling the skin. Creamy Eye Treatment with Avocado is a wonderful treatment that everyone should use at least 1 -2 days week. I find my eyecreams are predominantly "wrinkle" eye creams, and because of this, they eyecreams don't concentrate as much on hydration or moisturising. Therefore my skin around the eye area can get very dry and dehydrated. In steps in Creamy Eye treatment with Avocado. It has a rich and creamy feel and look to it, you just know it is going to be richly moisturising. Sometimes I just use this at night, it feels so good and by morning my eyes feel comfortable and hydrated again. I received a sample of this a few months back and after having scraped every last bit of it out of the sachets I'm very tempted to purchase the full size, despite the rather hefty price tag. The formula truly is beautiful, when you first apply it it's quite thick in consistency, but it quickly melts into your skin, leaving it feeling soft, hydrated and plumper than before! In my opinion it's definitely worth the price tag! Super rich and super thick - this eye cream needs to be dabbed on gently around the eye area. It goes on opaque white and thick and then it fades to a clear translucent colour after about a minute or two as it melts into the skin. It's so rich that there's no way any moisture in the skin can seem to escape so this seems to really trap in the moisture into the skin - great to apply straight after a shower or washing the face because of it's moisture-trapping abilites. I find that the fine lines around my eyes seem to become invisible when I put this on. Use as a night eye treatment. Don't rub this in (or you'd drag the skin) - just dab it on and tap it into the skin. Ideal for locking in moisture into the skin around the eyes area. used this years ago and have recently returned to it - i don't know why i ever stopped using it! I have started to get some 'crepiness' under my eyes with some subtle lines, and this has improved both within a week. I can only use it at night because the texture doesn't work under makeup, but that's okay because the intense hydration and plumping it provides at night lasts through the day anyway. I love that this doesn't move into my eyes, and I don't get watery or milky eyes with it (i have sensitive skin and eyes). You only need the smallest amount, so it's very economical. I won't be straying from this again! I received a small 1.5ml sample of Kiehl's Creamy Eye Treatment a few days ago after the sales assistant saw me try some from a tester on my hand. I was impressed by how hydrating it felt on my hand and she gave me a sample to take home. I used it today on my eye area and I must say that I am happy with how moisturising it is. It contains avocado and shea which are both great for dry skin. The cream itself is a yellowy-green, thick, balm-like salve. It is mainly unscented but does have a slight avocado smell. It really needs to be pat around the eye area as its thickness is hard to spread. It does stay put and doesn't migrate into the eye and you really don't need very much - a little goes a long way. I put the excess on to my hand and it actually makes a pretty good hand cream too. It has a cool,refreshing feel about it on the eyes and gives this area a slight glow. I used it on my eyelids too and didn't need to use an eyelid primer. The cream is definitely hydrating and even feels slightly firming - it kind of "sets" slightly. I found it gentle on my sensitive eyes. I think this is an excellent eye cream for anyone battling dryness - it's a nice hydrating eye product that does what they say it does. This is a beautiful luxuriously rich eye cream which is most suitable for use at night. I wouldn’t use it in the day time as it is quite thick and doesn’t fully absorb into the skin so I doubt makeup would apply nicely over it. The fact that it doesn’t fully absorb right away makes it perfect for use at night time. It is pale green in colour and reminds me of its namesake- avocados! Probably not helpful for young skin unless super dry. Great for older skin needing more hydration. I've been using this product for 4 weeks now and I'm really enjoying it. Such a luxurious eye cream, I will definitely repurchase it again. I'm really impressed with kiehl's products they never disappoint me, a bit on the pricey side however they actually worth it. I'm on accutane and this eye cream makes a huge difference, in hydration and brightening the whole eye area. Using this cream is like an equivalent of having a great sleep every night. Apply day and night to see great results. Anyone suffers from dehydration, puffiness and black circles. I was so bummed this didn’t work for me! I saw it used by almost every beauty you tuber I watched so had to give it a try! It’s lovely and creaming and is hydrating for my dry skin. I found it to be rather greasy though and it didn’t sink in to my skin as much as I would like. While it’s a nice product to use I didn’t find any lasting affects for my under eyes which was disappointing. I find a much better result from the simple range eye cream and it’s so much cheaper. So Hydrating and worth the coin!!! I suffer from really dry skin under my eyes and on my eye lids. My eye lids are wrinkly because they are dry and rough. I was in the search of a really hydrating and moisturising eye cream to battle the dry under eye area. This eye cream is so hydrating. I just feel the lush feeling it gives me when I apply this. I just feel it helps to smooth the skin out and in the long term eliminate the fine lines. This is an ultra rich eye cream, you just feel the creamy formula melting into your skin and giving you a fresh appearance. Whenever I apply this , my eye area feels so fresh , as if I have just had a vacation. The best thing is this cream does not irritate my eyes. My eyes are sensitive and water every time any cream gets into them so I have to be careful applying eye creams. With this one I applied a generous amount and still my eyes did not get irritated. This cream is really thick therefore you only require a tiny bit to apply. At first I used a generous amount and found it took a while to rub it in but then I learnt that I only need a small amount. I find this pot will last me a long time as it is quite concentrated Eye cream. I also enjoy applying this in the morning as it feels so cool and love the refreshing feeling it gives me. Worth it , in my opinion. If you have dehydrated under eye area, your will love this. So rich and moisturising. First, I got a free sample pack of a few Kiehls products. I read up on their story and they sound pretty cool. I love the history, the hands on aspect and that they use natural based products. I ask currently trying the eye cream for the first time. It sits really nicely - if that makes sense. I can feel it on my shin but its not cloying or clogging it just feels like my under eyes are having lushness lavished upon them. There's no defining scent. And I'll have to update on how iut appears afterward but for now with just this initial application out feels wonderful and relaxing. The price is pretty big. But seems like a very decent product. This little pot of magic has been a staple for my skincare for such a long time. I can't even remember when I found this product but I am so glad I did. It is so creamy and it nourishes my under eyes so well. Since using this my under eyes definitely have less creases, pigmentation and puffiness. While it is getting up there in price for such a small size, it is worth every cent! This is a rich and creamy eye cream that works wonderfully for my under-eye area. It is also gentle as it doesn't sting my eyes. I notice the skin under my eyes look and feel softer and smoother. Note that it only hydrates, it doesn't have any brightening or anti-aging effects, so if you're looking for an eye cream with these benefits, this cream may not be for you. The jar may get unhygienic as you have to dip your finger in to get the product. So I just buy a small size and use it within 5-6 months. This cream is a bit pricey compared to its size - but trust me, a little goes a really long way. This is my favourite eye cream. It can be used both in the morning or at night and while I don't have any wrinkles (yet! ), It makes my eyes look more refreshed and brighter. Because of this I prefer to use it in the mornings, especially after a big night out. I have gone through almost two containers of this now. It's great value for money because a little goes a long way. Its super hydrating but seems to sink in quite fast so that it doesn't look greasy or feel like its sliding off. I keep this in the fridge to help enhance its cooling effect. It feels like it really de-puffs your eyes when its nice and cold. And it feels amazing! This is a lovely creamy and protective eye treatment that I've been using for years and have re-purchased several times and will continue to do so. It is very moisturising, albeit a little greasy (so I do suggest using it at night instead of day), the thick texture means it doesn't migrate into your eyes like so many other products can do, which is awesome as it stays where you put it! However, because it is on the thick side you do have to take some care when applying it - you don't want to drag it across the delicate skin around the eye - just gently pat a small amount in to the area taking care not to exert to much pressure. I don't use it every night as I don't find I need it, also a little goes a long way so the price point doesn't seem quite as hefty as it lasts such a long time. Pat it on gently. Don't rub! Any one with skin around their eyes that needs a touch of moisturising. Kiehl's have long been known for their super effective and nourishing skin care. I was on the hunt for an uber moisturising eye cream, because I suffer from a really dry and dehydrated eye area and I could even feel the roughness of my skin. Even at nearly 24 years of age I have started to notice multiple fine lines around my eye, and could never get concealer to last under my eyes because it would crease so much from my eye area being dehydrated. I became really interested in this eye cream not only for Kiehl's reputation, but also because it includes avocado, which is well known for being an awesome natural ingredient for nourishing and protecting the skin. Since avocado contains antioxidant carotenoids which protect against environmental skin damage, Vitamin C for elastin and collagen production, and Vitamin E for protection against free radical damage I had high expectation for this eye cream and let me tell you, they were definitely met strongly! Just by looking at the ingredients list and the simple yet elegant packaging you know you are in for a treat! The formula for this eye cream is really interesting. Initially, it feels quite thick and heavy, and I attributed this to the inclusion the avocado oil and shea butter. But once it is applied to my skin area it glides on and literally just melts into my skin like water. This formula is also amazing because its not wasteful or it doesn't get used up quickly, because the smallest amount of product delivers a huge amount of silky cream to my eye area once it starts to thin our and melt into my skin. I always look forward to the time when I can next apply this eye cream! Also, the non-migrating formula of this product is essential for preventing any eye irritation. Past eye creams that I have used can sometimes migrate too closely to my eyeball and could cause some serious burning and weeping, but this one doesn't. The biggest winner for me with this product is how insanely moisturising it is! It really feels like a little luxurious whenever I apply it. I could notice the difference in my eye area within about a week. It didn't feel dry or rough anymore, and it pretty much eliminated the creasing underneath my eyes when applying concealer. I have noticed that my concealer applies so smoothly now as well. Some days when I start to notice a little creasing, I always make sure to add just a little more of the eye cream at night and let it sit in my eye area for about 10 minutes, almost like a mask and it really helps to add even more moisture and prevent this creasing. Even though its main purpose is not designed for reducing the appearance of fine lines, I feel like it has made a difference and filled them out a little. Definitely noticeable. I also don't suffer from dark under eye circles so I cannot comment on its ability to counteract that. Overall, my eye area is left supple, firmed up, moisturised, smoothed out and glowing! At $75, it may be expensive for some, but to me it is totally reasonable considering the effect I get from it. And because it lasts for so long, to me it's good value for money and I will definitely consider repurchasing it if I don't find another that beats it. Reduced my eye area sensitivity! I have always had a real issue with products stinging my eye area, making them red and itchy and awful. Especially my outer corner area. This cream is soooo hydrating, I apply it every night quite thick all around my eyes (like really, everywhere) and since I have been using this, the same products that were hurting before don't make my eyes red or dry or sore at all. I'm not sure that it really helped with dark undereye circles (so it loses a star there, also it's expensive), so that's a negative, but at least I can wear concealer now without it hurting! On that note, it helps my concealer go on so smoothly as the area is super hydrated. I have had this jar for nearly a year, and its still half full and I definitely wear more product that the normal person would - it sits as a white lump under my eyes (lol good look) but doesn't budge! It never creeps into my eyes even when I put a heap of it on. Don't be fooled by the size of the tub of this eye cream because it can last quite a long while if you pat the formula sparingly which is all you really need as the cream is quite thick and can feel heavy at first upon application but quickly absorbs into the skin. After a month I can already see that my undereye circles appear to be lighter and my undereye area is less puffy and more hydrated. Use it not only at night but during the day. Apply a small amount as it is not uncommon to develop milia with this sort of concentrated formula. I loved this eye cream. It depuffed my eyes and kept it moisturised. The texture is quite thick and creamy but it spreads out well when you gently dab it on the eye area. The product is ophthalmologist and dermatologist tested so it's suited even for sensitive skin. I also like how it comes in a jar - it is simple and easy to travel and I can get every single bit of the product out. It is very reasonably priced, and I would recommend to those looking for a good eye cream. This little beauty hydrates my eye area and the dark marks and fine lines appeared reduced after using it! and you only need a tiny tiny bit to cover your whole eye area, a little goes a seriously long way! awesome product! also have no problems using makeup over it, winning! 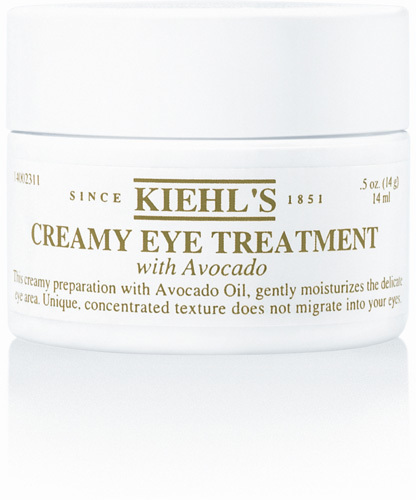 Was seeking a new eye treatment so purchased the Kiehls creamy eye treatment with avocado. The cream was rich and applied easily however I found that it was a bit too thick for my under eye area and as a result, broke me out. I had tiny bumps under my eyes. Perhaps it is best for people with very dry skin under their eyes or for mature skin.